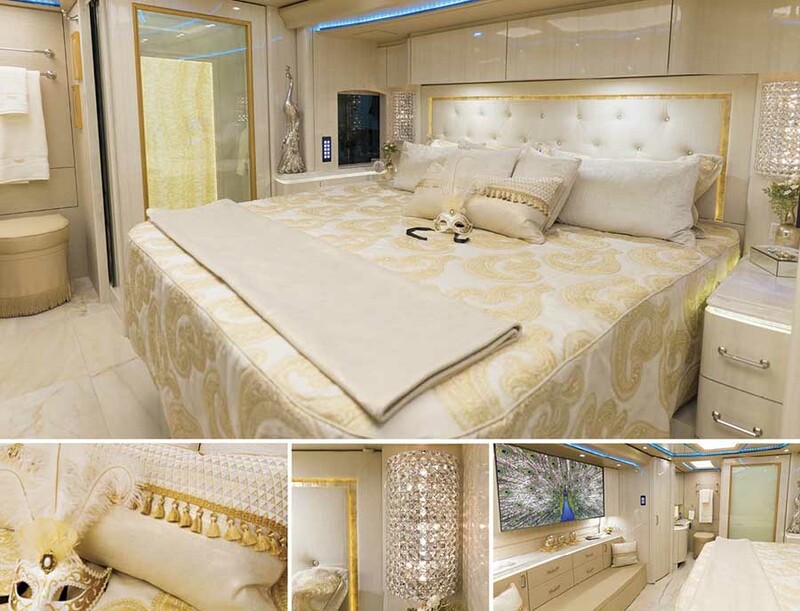 When Marathon Coach Vice-President of Interior Design/Engineering Alan Christianson first envisioned Show Coach #1281, he imagined a sparkler, something 100% luxe, a coach that not only dazzled, but also inspired. From engineering to cabinetry, mechanical to flooring, upholstery to interior design, in one deft stroke, Alan and the Marathon team managed to create a true show piece that quickly garnered attention from the Travel Channel and beyond. The spacious and refined salon streams with natural light, clearly conveying that bright and happy days are here. The front-facing fireplace with glimmering trim accent provides a charming radiance, while the quietly refined, neutral walls and “Witch Hazel” polished solid surfaces provide the ideal color palette for opulent accents. The dynamic design features are artfully rooted in both form and function. For example, the stunning porcelain floor tiles are heated from below and easy-to-care for, while the tufted velvet sofa effortlessly converts into a comfortable sleeping area for guests. Also, the leather recliner is motorized, and the end table houses a laptop slide and “magazine” rack, perfect for periodicals, laptop computers or tablets. Created for entertaining, the galley is defined by its details with its concealed appliances, such as a hidden microwave/convection oven and dishwasher drawer, elevating the space flawlessly, visually streamlining and extending the salon area. An unexpected treasure is hidden behind the elegant, handcrafted art door. Push the button or the use the coach’s voice-controlled intelligent personal assistant to open the door to discover the dream kitchen appliance center, consisting of a Miele espresso machine/coffee maker, steam oven and wine cooler. Unlike coaches with traditional doors, the pocket door on the mid-ship water closet allows the creation of more space in the hallway simply by leaving the door open when not in use. However, the true magic is found at the rear water closet. Liquid crystal walls go from slightly frosted to completely private with a push of a button. So whether you want to enjoy the hot water cascading from the rain shower head while watching the game on the bedroom TV or create a private oasis separate from the bedroom, you can. As night falls, the grand master suite is the epitome of luxury with its regal-looking gold and ivory custom-designed comforter. The upgraded, adjustable king bed is ideal for watching favorite programming on the 55-inch Samsung TV; however, for avid travelers, it also allows a comfortable pathway to the rear of the coach, even with the slides in. The backlit headboard, crystal sconces and lustrous pulls complement the polished accessories, flawlessly pulling everything together. 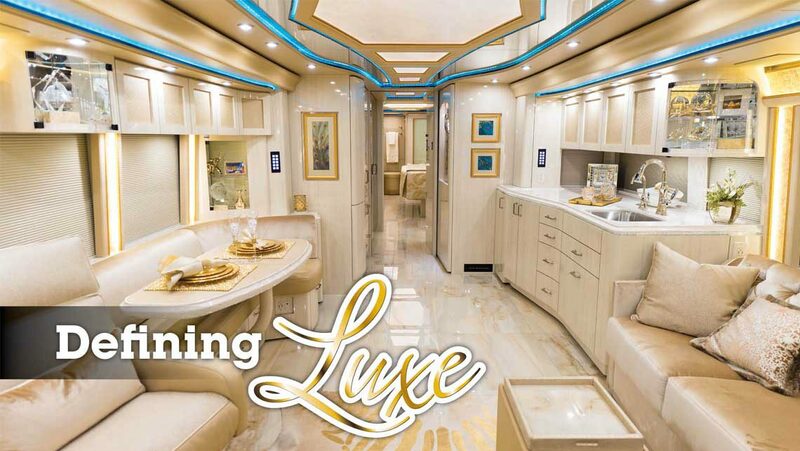 Well thought-out with modern sensibility, by paying attention to each object no matter how simple or complex, Alan and the Marathon team was able to create the hallmark of luxury motorcoach living. This H3-45 quad slide – forged in Oregon, filmed in Nevada and a star across the country – redefines luxury travel.